Olive Garden Three Meat Sauce was recently served with their famous never ending pasta promotion. Olive Garden is known for their delicious pasta sauces. During their never ending pasta bowls special they always introduce special sauces. What makes the Olive Garden Three Meat Sauce so good? It is using a variety of meats that gives this recipe extra flavor. This recipe starts out with a simple marina sauce, and then we add seasoned ground beef, Italian sausage, and pepperoni. These specially seasoned meats makes this sauce taste so good. You can recreate the Olive Garden Three Meat sauce. The three meat sauce is often served when the never-ending pasta bowls are being served. Saute onions in a large pot with about 2 tablespoons of olive oil. When onions have become translucent add the two jars of marina sauce, and can of chopped tomatoes, and turn down to simmer. In a large skillet brown ground beef and Italian sausage until completely cooked, drain fat from meat, and add meat into the large pot with the sauce. Add chopped pepperoni to the sauce mixture. Add 1 teaspoon of Italian seasonings to mixture and all to simmer for about 20 minutes before you season to taste with salt and pepper. This makes a very large pot of sauce, if you have a larger family, consider stretching the sauce with an additional jar of marina, or a can of tomatoes. Since we are adding so many different spicy meats, wait until the all of the meats season the sauce before making any adjustments. If you have a smaller family, you may want to freeze this sauce, and use later. Do you just love the Olive Garden, we have many more recipes that taste just like Olive Garden Recipes here at Copykat.com. The Olive Garden adds Merlot, how much I don’t know, but with this much sauce a cup wouldn’t be out of line. This is wonderful over angel hair pasta which holds the sauce much better than normal spaghetti. I think wine often makes a sausage extra special. My sons really liked this sauce. It’s going into regular rotation. I make this sauce, but cook my own tomato sauce with the meat, but add chianti towards the end of the 2 hrs of simmering, WOW does this kick it up a notch! how much chianti do you add to your recipe? that would make it more similar to olive garden’s recipe! This recipe was from 2011 Never Ending Pasta bowl, I don’t recall the chianti. I would start with about 1/4 to 1/2 cup to see how that tastes. I’m definitely going to try this! 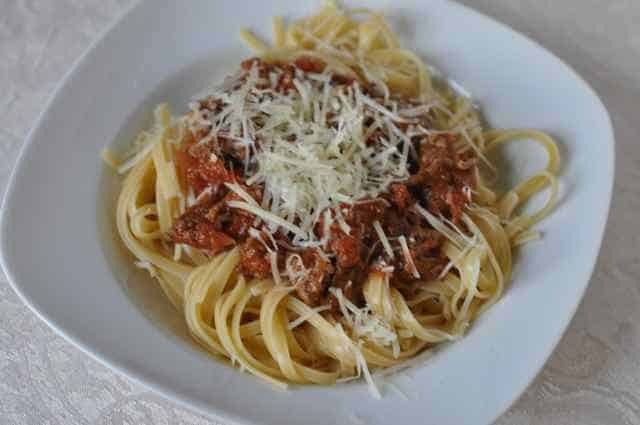 I’ve been trying for years to find a recipe for meat sauce to serve at home that has the flavors of restaurant sauce. My previous attempts have resulted in a bland tasting sauce with almost no tomato flavor left at all. Hopefully this one will work! We had a total of 10 people last night for dinner. Several went back for 2nds and one person, thirds! There was plenty of food and everyone absolutely loved it. I did add in one extra jar of marinara sauce because I was afraid I might not have enough. I had some for lunch today and there are still a couple of servings left!!! I just love a hearty pasta sauce with lots of meat. Delicious. Jamie, I am presuming it is Marinara sauce, as this is not a fishy dish, as a Marina sauce would imply. Does the ingredient really mean “Marinara” sauce? I’ve never heard of Marina. Thanks.